Nissan is offering an additional £500 deposit contribution to drivers of older hybrid vehicles which could attract a £2,898 annual London congestion fee. The offer applies to orders placed for Nissan’s LEAF EV from June 1st and registered by June 30th and applies on top of the manufacturer’s existing 3.99% APR Representative PCP offer this June. 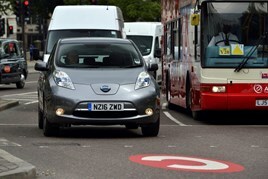 Edward Jones, EV manager, Nissan Motor (GB) Ltd said; “When the Congestion Charge zone was introduced in 2009, hybrid vehicles were considered the ‘green’ option for getting into central London for free each day. A sunset period on congestion charge changes being imposed by Transport for London comes to an end on June 24th but all-electric models are 100% exempt from the price hikes which will affect some motorists. Under the new Ultra-Low Emissions Discount (ULED) drivers of vehicles emitting between 75g/km and 100g/km must pay the daily charge of £11.50 – or up to £2,898 a year. Only ultra-low emission cars or vans with CO2 emissions of 75g/km or less that meet Euro 5 standard qualify for the ULED. At 0g/km CO2, Nissan’s full LEAF range is eligible for the 100% discount. Jones added: “Just like Transport for London, and the government, Nissan believes all-electric vehicles are a better mode of personal transport for urban environments.